It’s in Christ that we find out who we are and what we are living for. Long before we first heard of Christ...he had his eye on us, had designs on us for glorious living, part of the overall purpose he is working out in everything and everyone. Dramatic art in its various forms is the one common language most widely recognized and understood in our world today, and at RRCA, we believe in the importance of teaching young people the value of serving the Lord through the ministry of theatre. It is our goal to equip students with life skills that are learned in the process of teaching character study, discernment, communication skills, team building, and accountability. Students are encouraged to develop a healthy understanding and appreciation of the performing arts and media, by providing them with learning & performance opportunities that will enable them to move toward excellence in their creative expression with an emphasis on Christian responsibility & ministry. The RRCA theatre program, under the direction of Mrs. Debbie Dean, includes programs for 6th through 12th grades. In each of the classes, we combine the study of theatre history with the analysis & performance of a wide selection of theatre styles. Classroom exercises work toward building basic & intermediate acting skills and stage techniques, by means of individual & group participation in pantomimes, improvisations, scenes, literature analysis & interpretation, evaluation and critique. Our curriculum includes projects involving students in performance and production training: planning, preparation, organizing, and rehearsing. Throughout the year, students participate in one-act play contests, along with speech & forensics contest venues. We also look forward to attending various live performances, and hosting several training workshops & performance groups. 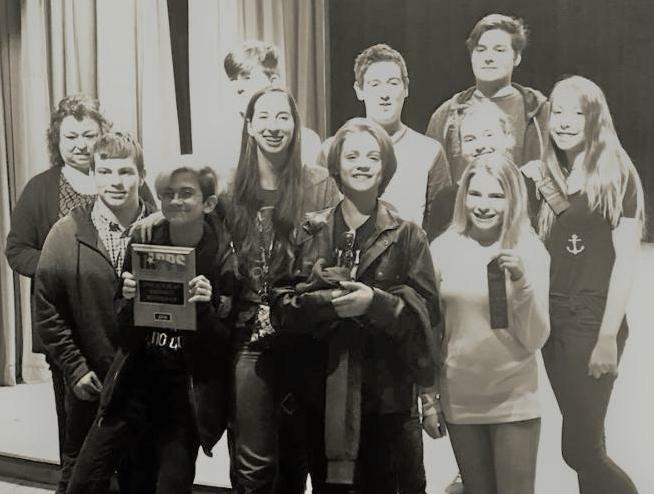 Congratulations to the RRCA Drama team who placed 2nd in District for One Act Play and are on the way to represent at State on November 12-13, 2018.